Gathering all your old files, organizing them into boxes and driving them to a shredding facility can be a hassle and take up your valuable time. Mobile shredding, also called onsite shredding, offers the perfect solution. Shredding your information is necessary to protect it from identity thieves. There are also federal and Ohio state laws prohibiting the irresponsible disposal of documents containing sensitive information. Shred Nations Cincinnati can send a truck equipped with an industrial shredder right to your curbside, anywhere in the Cincinnati metropolitan area. Mobile shredding offers a more efficient, convenient way to shred the important documents you have laying around. First off, you will want several quotes on the price of your project. Fill out the form on the right or give Shred Nations a call at (513) 348-1845 for free quotes. Within minutes we will be in touch, connecting you to a Cincinnati mobile shredding company that can get your project done quick and affordable. Once you have your option, choose the company that best fits the needs and budget of your project. They will set you up with locked shredding bins. When your bins are full, the shredding company will schedule a time to send a mobile shredding truck to your location anywhere in Cincinnati and shred your materials onsite. Our contractors never come in direct contact with your paperwork (it remains in the locked bins up until the moment it hits the shredder’s teeth). After the shredding, you’ll receive a certificate of destruction detailing your shred job and verify that the process complied with federal and Ohio laws. How Secure is Mobile Shredding in Cincinnati? Security is the entire reason to shred your information, and if you’re using a 3rd party company to do the dirty work, you will want to make sure the job is done right. Shred Nations Cincinnati helps protect your confidential information by eliminating the risk of misplaced or mishandled documents. A mobile shredding company provides locked shredding bins and a certificate of destruction for every project to ensure compliance with federal and Ohio laws—including FACTA and HIPAA. How Much Does Mobile Shredding Cost in Cincinnati? 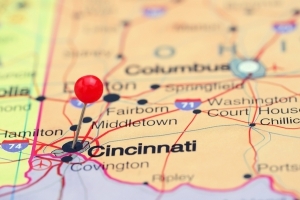 The Cincinnati industry average for a shredding truck to visit your location and shred your materials onsite is about $100—depending on your location and any special requests you might have. Retail drop off services usually charge about $1 per pound, so once you reach about 3 boxes worth of paperwork, mobile shredding becomes a cost-effective alternative (while also saving time and hassle). But always check how far you are from your shredding company—the closer you are, the cheaper the job becomes. For free quotes on mobile shredding services for your sensitive files in Cincinnati, give us a call at (513) 348-1845 or fill out the form on the right. We will get in touch with you in minutes with free quotes on mobile shredding services throughout the Cincinnati metro region. Our normal business hours are Monday—Friday from 8:30 AM to 7:00 PM, and Saturday 10:00 AM to 4:00 PM.